Review: Corel’s venerable image editor offers more for artists and illustrators than you might expect. Photoshop remains the more powerful choice and has better art brushes, but PaintShop Pro certainly gets the job done. PaintShop Pro has been around since 1990 in one form or another, meaning it’s only a couple of years younger than the doyen of graphics software, Photoshop. The two products are broadly similar in that each caters for a wide range of designer and artist needs, including photo-editing and illustration. PaintShop Pro competes on price rather than features: it offers a subset of what you can achieve with Photoshop, but for much less dosh. What you get for your 60 quid (which buys you about six months of Photoshop access, even on Adobe’s best-value subscription plan) is a package that’s capable and well thought out, but probably won’t offer the seasoned creative many surprises. The Ultimate version costs £20 more, but the extra features are geared towards photographers, not artists. The tools are divided into three areas: Manage, Adjust and Edit. Manage is a basic cataloguing facility, enabling you to locate your image then open it in either of the other two areas to work on. It actually works better as an integrated tool in PaintShop Pro than Adobe’s awkward system of maintaining its organiser, Bridge, as a separate program to Photoshop. 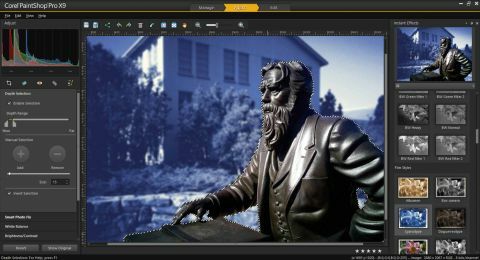 Edit is where your artistic muse can best express herself, and is the area in PaintShop Pro that most resembles Photoshop, with tool palettes and panels. There’s a basic Brush tool and an Airbrush, but the coolest part for artists is the choice of natural media brushes, including oils, watercolours and pastels. It’s not about to challenge PaintShop Pro’s stablemate Painter for media, but it’s versatile enough. You can customise brushes and save them as new presets, but not with anything approaching the versatility of Photoshop. It’s worth noting, though, that you can import Photoshop-compatible brushes. Layers are the other prerequisite of any decent painting software, of course, and PaintShop Pro has a good layer system, complete with blend modes for easy effects. You can add a mask as its own layer, which is less flexible than Photoshop’s approach but probably easier to grasp for beginners. The other working area is Adjust, which is designed for working with photos but is still of some use to artists. You load your image, then make universal changes to it, either through sliders or by picking an Instant Effect, one of dozens of ready-made looks. It’s tools like this that help make a good argument for PaintShop Pro as a companion program to Painter: create your artwork in Painter, with its full complement of natural media tools, then bring it into PaintShop Pro to make last-minute overall tweaks and prepare it for use. PaintShop’s Project Templates, for example, mean that you can quickly take your image into a pre-designed business card or greeting card. There’s a lot more to PaintShop Pro X9 besides. It’s in the nature of wide- ranging programs like this that you’ll leave many of its tools untouched – until the day you realise that one is just what you need to address a creative problem. Photoshop remains the more powerful choice and has better art brushes, but PaintShop Pro certainly gets the job done.